I’ve been so busy, I haven’t been able to keep up with the blog. I went out another 16 times since my last report in July, but I just didn’t seem to have the time to post. 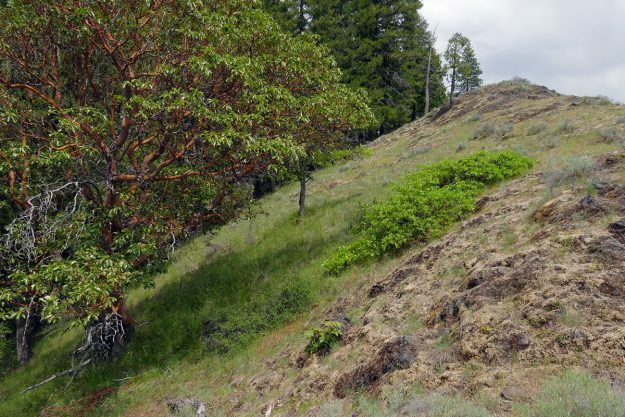 So—now that the year is just about over—I thought I’d try to at least post some photos from the most interesting of those trips—many were just seed-collecting trips to familiar places for the restoration work on my own property. Looking for more purple milkweed (Asclepias cordifolia) sites in the Rigdon area of southeastern Lane County was still one of my top priorities for the year. 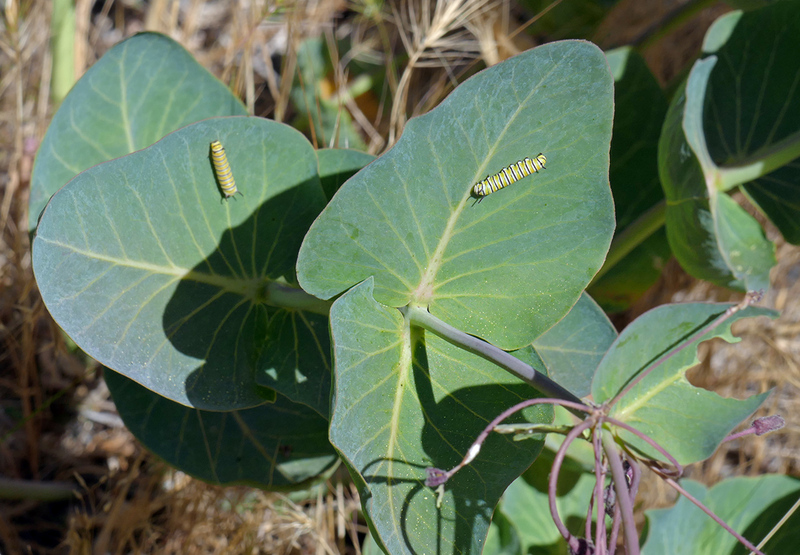 While I wasn’t able to find milkweed in most of them, I did find some interesting spots. Purple milkweed dying back at the quarry meadow. A lovely madrone (Arbutus menziesii) grows on the backside of the rocky ridge. Looking south toward the Calapooyas from “Buckbrush Meadow,” Dome Rock can be seen on the far left, and the snowy patch in the center is Bristow Prairie. John enjoying the view (and a moment of sunshine) at our first new meadow site of the year. Two monarch caterpillars sharing the same purple milkweed plant. Last July, I discovered an awesome new spot in the Calapooyas, Potter Mountain (see Natural Rock Garden at Potter Mountain). Since I’d missed the early bloom, it was high on my list of sites to revisit this year. On Sunday, May 31, I returned to see what else might be up there. Staley Creek Road 2134 is usually in good shape, but it did require moving a few small rocks. Still I got up there no trouble (and left it a little clearer for my next trip up). The day was rather overcast but the clouds came in waves, so I did get some sun off and on. 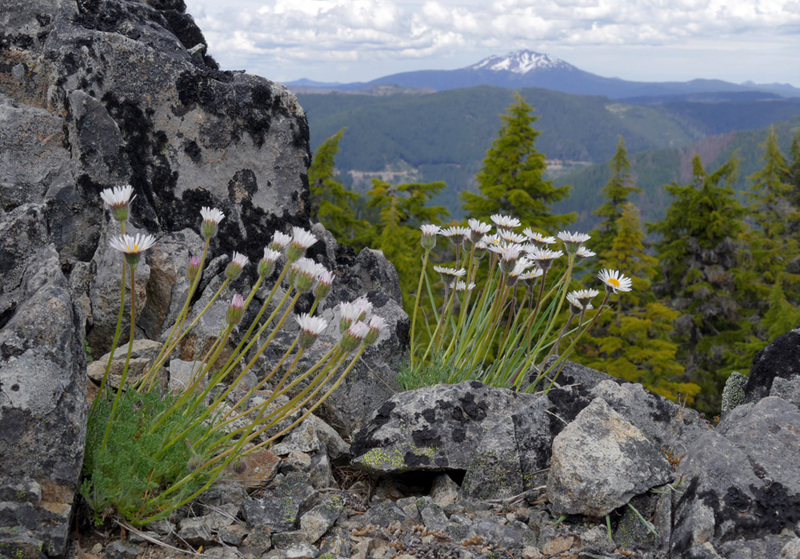 Cutleaf daisy (Erigeron compositus) growing right on the rocky, spine of the ridge. 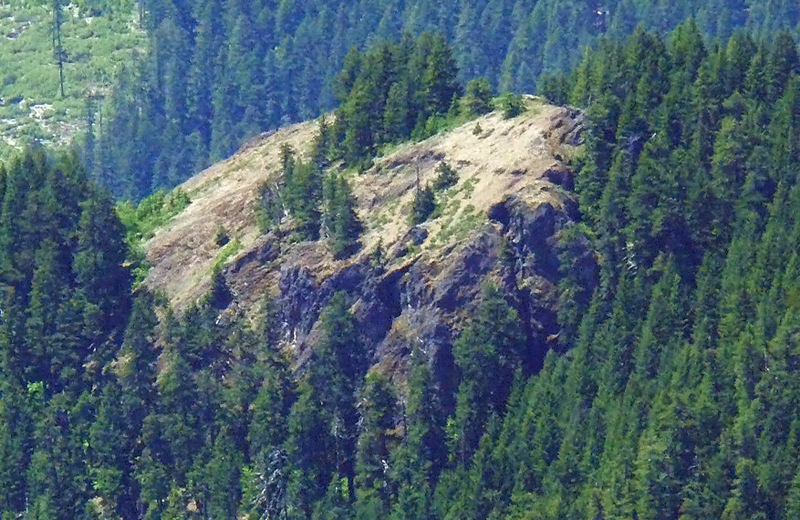 Diamond Peak can be seen to the east. 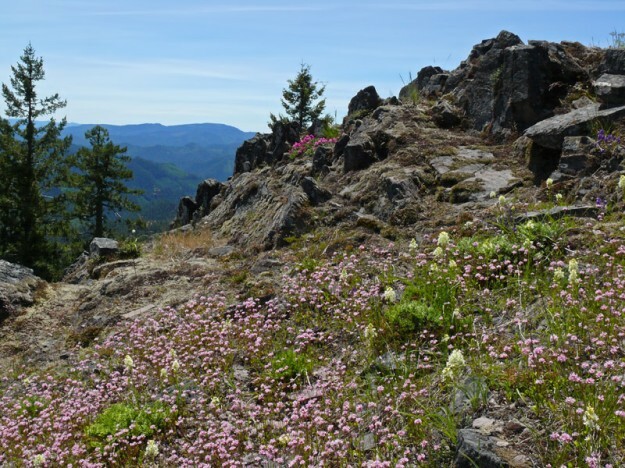 Siskiyou fritillaries sure grow well on Heavenly Bluff. 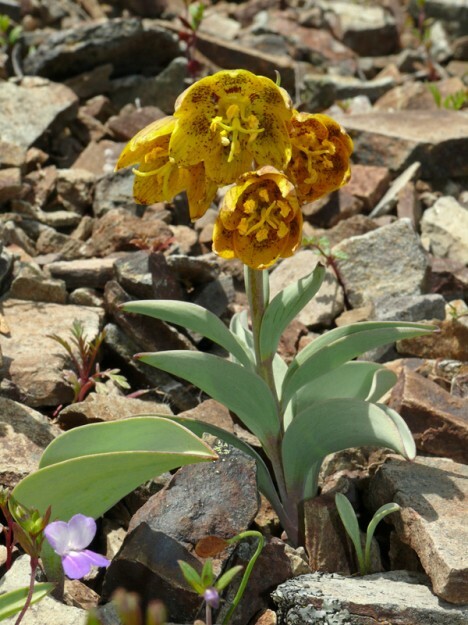 With a week of dry weather and the snow quickly retreating to higher elevations, I wanted to head back to Heavenly Bluff to get another look at the beautiful Siskiyou fritillary (Fritillaria glauca) there. 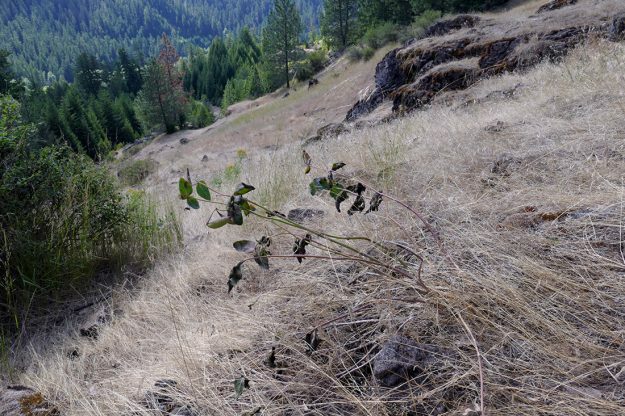 Last year when John Koenig and I went up there (see Siskiyou Fritillary in Lane County ), we were having an extremely dry May, and despite some snow on the road, the frits were past peak. I thought we might have better luck this year since, although things are still early, we’ve had regular rain all spring. So Sabine Dutoit, Nancy Bray, and I headed up toward Heavenly Bluff on May 12, just 2 days later than my trip with John last year. After all the obstacles on the road on that trip, I figured we’d better have a backup plan, so since we were going right by the Bearbones Mountain trailhead, we could go there if we couldn’t make it to Heavenly Bluff. 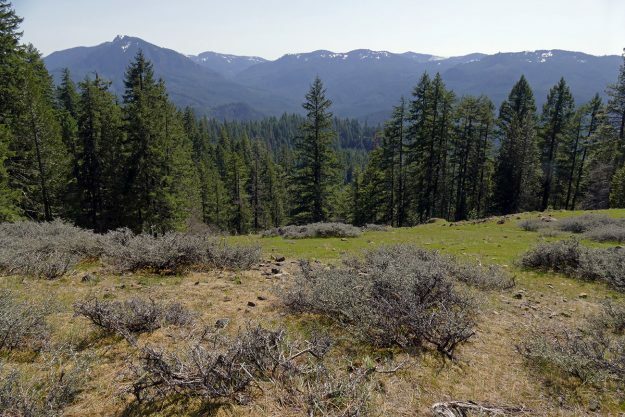 Last year, I discovered what is currently the northernmost known site for the lovely Siskiyou fritillary (Fritillaria glauca). 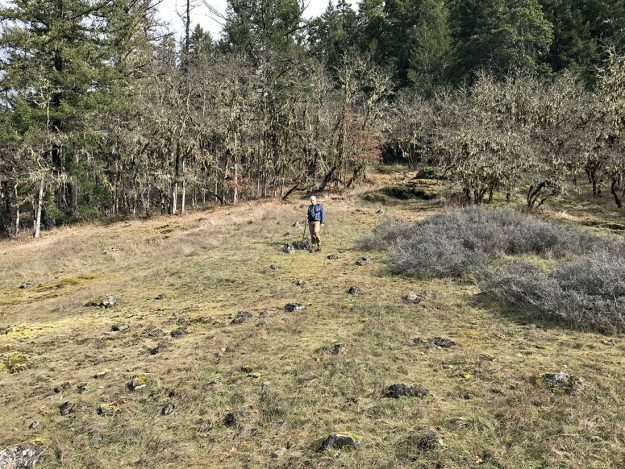 I purposely did not write about it in my report about Heavenly Bluff, A Heavenly New Site in Lane County, because it has been considered a rare plant, and the Oregon Flora Project and Oregon Biodiversity Information Center had been withholding location data for the reported sites. Evidently there are enough populations now that their locations are no longer withheld, so I guess I needn’t be so circumspect. 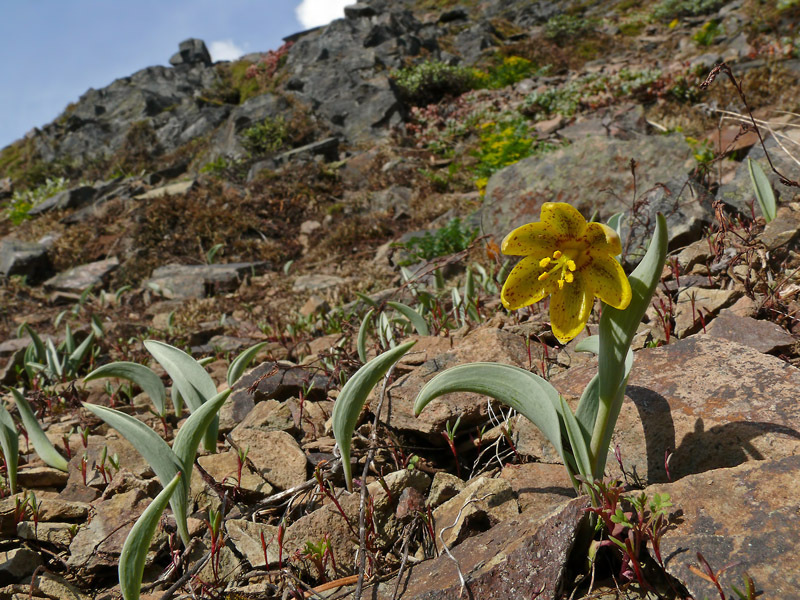 Fritillaria glauca happily grows en masse in the loose rock of a steep slope. The plants spread by little bulb offsets sliding downhill along with the gravel. Rosy plectritis, death camas, and cliff penstemon blooming beautifully on the side ridge.